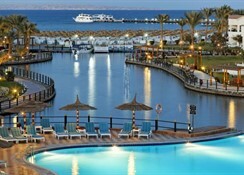 The Dana Beach Resort Hotel in Hurghada, Egypt is a luxurious, 5-star resort facing the serene Red Sea. A plush hotel brimming with warm hospitality, it is loaded with amenities such as a lagoon-style outdoor pool, a diving centre and a piano bar. The lovely golden sandy beach on the magnificent Sahl Hasheesh Bay draws many tourists who seek sun and sand. With 734 well-furnished rooms, and an indulgent all-inclusive package, the resort frequently ranks as the top favourite hotel for couples, families and solo travellers. An array of mouth-watering dining options, relaxation facilities and lively entertainment programs are some of its other attractions. Choose the Dana Beach Resort Hotel to make your Hurghada holiday a memorable one. 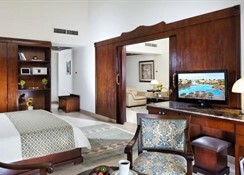 The Dana Beach Resort Hotel is just a 15-minute drive to Hurghada International Airport. There are shops, cafes and restaurants, which are all a short distance away. Shuttle services to the nearby town is available for a small fee. The Dana Beach Resort Hotel has 734 guestrooms with large windows and furniture made of light wood. Each room, with en suite bathrooms, is stocked with hairdryers and bath amenities. These rooms are equipped with fully-furnished balconies or terraces, with gardens and amazing views of either the hotel’s pool or the sea. The bathrooms have showers, satellite televisions, hair dryers, telephone sets, mini fridges and lockers. The Superior rooms come with additional living spaces, carpeted floors and bath tubs. The main buffet restaurant offers international and Egyptian delicacies. 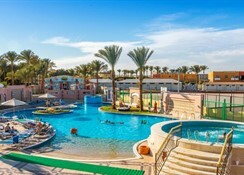 There are eight bars namely Lagoon Pool Bar, Red Sea Bar, Island Bar, Le Rendez Vous, Caesar Bar, Alexander Bar, a Piano lobby bar, a beach bar and a pub. Four à la carte restaurants serve Italian, Mediterranean and Egyptian delicacies. There is a private beachfront facing the Red Sea, decked with sun chairs and loungers, where guests can relax and be served drinks from the hotel’s beach bar. The are 3 outdoor swimming pools (2 of which are heated) for adults and children, sun terraces, sun beds and mattresses, parasols and towels for the pool and the beach. Guests can indulge in a number of sports during their stay, including tennis, diving, billiards, beach volleyball, handball, volleyball, basketball, boccia, dart games, golf and so on. There is also a fitness room, a Jacuzzi, sauna, steam bath, and a number of fabulous massage treatments. For the children, there is a mini club, pool with slides and regular entertainment programs. Rates and conditions are not valid for Saudi Arabia, Kuwait, Qatar, Bahrain, Oman, Iraq, UAE, Egypt, Lebanon, Jordan, Syria, Libya, Morocco, Tunisia & Algeria. Excellent five star hotel. Have stayed in Dana Beach a number of times. Food and service is excellent and the rooms are very clean. The gardens, beach and facilities are far better than other hotels we have stayed in Hurghada and we would reccomend this hotel.